Certified nursing assistants (CNAs) are members of staff who work under the direct supervision of registered nurses, licensed practical nurses and / or physicians to provide the majority of the routine care and activities of daily living for patients who require basic care. You are reading page 2 of Certified Nursing Assistants (CNA). If you want to start from the beginning Go to First Page. Glycerine82 has 3 years experience as a LPN and works as a Licensed Practical Nurse. CNA's are one of the top ten most underpaid professions in the country. No, we don't go to school for very long, but we ARE required to take a few classes and pass an exam. I'll never understand why they pay has to be the same as someone working in fast food. (Sometimes, worse!) I feel like the mentality is that CNA's aren't as educated as nurses so they don't work as hard. That is just simply not true! Argh! Makes me insane! For the amount of work involved and the stress It puts on our bodies and minds, one would think we'd get paid MORE for all of that, not less. Makes me sad. You are completely right! The NA's in NYC make $20.50 an hour but to even get a 1 bedroom in the area, your rent is roughly $1,500 a month (and that's if you live on the outer parts of the city). I agree with nygirl I'm from New York as well and cost of living is so expensive pay seems good compared to other states but it all evens out with cost of living ! Yes, the cost of living makes all the difference. 20/hr wouldn't really be all that much where I came from in MA. I pay 2x less rent than I did when I lived there. You can do all the research you want and move anywhere you want but the simple truth is that nursing assistants get paid a lousy wage. If you want to make money doing this kind of work you have to stick with it for many, many years or go to school to become a Nurse. linzarelli works as a Neuro-Acute RN. Yeah my parents wanted me to move to nc to be closer to them but I would take a $6 paycut compared to new grad positions in AZ. I'm in SC and It makes no difference. The pay cut doesn't hurt because rent is so much cheaper. If I go to MA i will make 6 more an hour but I will also pay 900 more a month in rent. Assistant and it has truly intensified my passion for the nursing profession. I love taking care of people. I love being helpful and appreciated. You don't have to work in just nursing homes or other long term care facilities. You can work in hospitals, clinics, diagnostic centers, and other medical settings. Becoming a CNA is a great start or stepping stone towards a bright future in Nursing. The pay could be a lot better though but it depends on where you live, experience, who you work for, and etc. For instance, if you get hired by someone to take care of an older relative or a person with an illness that needs to be assisted, you could get paid up to $100 a night...maybe more. Live-in care or assisted living care probably pays a lot more. You don't have to work in just nursing homes or other long term care facilities. You can work in hospitals, clinics, diagnostic centers, and other medical settings. This is true, but the more "desirable" jobs in hospitals, clinics, disgnostic centers and other settings are a tad bit less abundant because CNAs tend to not leave these gigs once they land them. Due to the increase in the aging population, LTC will be king for many decades to come. The CNA who turns his/her nose up at LTC might be jobless for months (or longer). I am a CNA and I just got a job in a hospital. I don't start for another couple weeks, but I am very excited. I plan to work in this hospital while I work my way up to LPN then to RN. It's like being a child and watching yourself grow up. It's so cool. SeattleJess works as a Nursing Student. ...take a few classes, pass an exam AND in LTC spot the signs that nurses are extremely unlikely to see and alert them so that the most significant part of our care is what DOESN'T happen. Congratulations! I am convinced that your CNA experience will make you a much better nurse than the ones who never worked in CNA shoes. 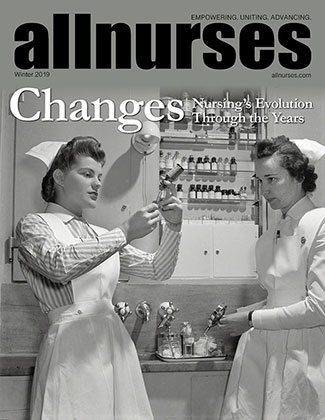 Certainly it will make you a much better supervisor to the CNAs in your charge! Wishing you support from management and your team mates as you grow in your profession.